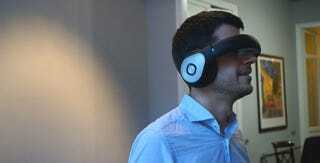 The Avegant Glyph is a strange headset we tried back at CES. It's close to virtual reality, but it's not true VR. It's a sort of semi-immersive video experience paired with high-quality audio. We tried the newest prototype and, even better, the new Jellyfish headset based on the same Glyph tech. It was fun as hell. If you haven't seen it before, the Glyph is a surreal hybrid between over-the-ear headphones and a video projector that displays images right into your retina. You can use it as a pair of headphones (and yes, the sound quality is pretty good), although its bigger and chunkier than most of the high-end headphones out there. Lower the head band over your eyes, though, and the device transforms into a video headset that, connected to your phone or PC, beams whatever you want right into your eyes. The idea might seem bizarre, but it got more than $1.5 million in its Kickstarter campaign, and a huge $9.3 million round of investment later led by Intel. So yeah, they have big pockets. Instead of using a big LCD or OLED screen, or even some micro-displays like the Sony Morpheus, the Glyph uses digital light projection built right into the headset, which is quite impressive from an engineering perspective. That results in a image resolution of 1280 x 720 for each eye, but given that you are not looking into a screen directly, the perceived image quality is technically above that. Is it really better though? Yes and no. We tried the new prototype that the Avegant team is building at Mobile World Congress in Barcelona, and there's good and bad news. The headset is lighter and more comfortable than earlier versions. The company has been testing various components to improve design—like different nose bridges to better adjust how the thing sits on your face—but the Glyph still has a long way to go. The ergonomics are are still a major drawback. The headset falls down in the back side, so you have to push it up with your hands to really get a clear view. Avegant says is working on fixing that and the final version will adjust perfectly. When you manage to adjust, yes, the image quality is fantastic, although the overall experience is not overwhelming. This is a unit close to the final one, but still a prototype, so nevermind those internal cables. I saw various 360 degree videos in the Glyph, including one really impressive one filmed aboard a fighter jet. The head tracking system provided by the Glyph gives you a full view of what´s around you, with practically no latency. It's a predictably cool trick that any headset worth its salt can pull off. Playing video games on the Glyph can get a bit confusing due to the ergonomics issue but, if that issue is fixed, the potential seems promising. I tried Alien: Isolation and, although it's not as immersive as it would be in, say an Oculus Rift, it is cooler than just playing it on your TV from the sofa. The fact that the Glyph doesn't completely cover your eyes is actually super useful here, because you can quickly peek into the control keys in your laptop if you need to, shifting easily between reality and game. Of course, the real draw of the using the Glyph is the possibility of using it as a pair of headphones on the go, or to watch movies on a plane or something. And with this latest prototype, I can see the hints of that use-case, but it's going to be a hard sell if if Avegant can't considerably shrink down the design. It's headed in the right direction, but can it head there fast enough? We'll find out when the final Glyph goes on sale this fall for $600(!). Avegant also gave us a peek at one of their new side projects, codenamed Jellyfish, that we might get to see turn into a real product later this year. It´s basically a new headset design that uses the same technology behind the Glyph, but in a more traditional VR headset form. I tried this new headset connected to a GoPro camera strapped in front of a high-speed RC car. What? Yes, you basically get to see in real time and right in front on your eyes what the GoPro is filming. No latency whatsoever. None. We went to a park in Barcelona and gave it a try. In a matter of minutes I was surrounded by half a dozen dogs barking at my eyes. I also got the chance to see from the perspective of a 4K camera of a DJI Inspire 1 drone. Suddenly I was up in the air watching an amazing sunset through the drone camera 40 meters high over the roofs of Barcelona. It felt like magic. Granted, these are pretty easy tricks for pretty much any virtual reality headset to pull of. You can experience similar things—although slightly lower quality—with tech as barebones as Google Cardboard. And in order to hold its own against more intense VR headsets like the Oculus Rift, Sony's impending Project Morpheous, and the new HTC Vive, Jellyfish would have to offer far more than just the basic (but still awesome) tricks. Competition is getting fierce, and for as much fun as it was, it seems unlikely Jellyfish will be able to keep up. But it was still a hell of a lot of fun, and no matter what headset it comes in: I want more.